Ryan Howard celebrates with Cody Asche past Miami Marlins catcher Jacob Realmuto after Howard hit a two-run home run off starting pitcher Dan Haren during the sixth inning Tuesday night. PHILADELPHIA — Ryan Howard hit a go-ahead two-run homer, Freddy Galvis also connected to back Jerome Williams, and the Phillies beat the Miami Marlins 7-3 Tuesday night. Williams (1-1) allowed three runs — two earned — and eight hits, striking out six in six innings. The slumping Marlins lost their fifth straight game, falling to 3-11. Manager Mike Redmond didn't get an endorsement from owner Jeffrey Loria after meeting with him and general manager Dan Jennings before the game. Miami starter Dan Haren (1-1) gave up four runs and four hits in six innings. Giancarlo Stanton hit a 453-foot homer for the Marlins. 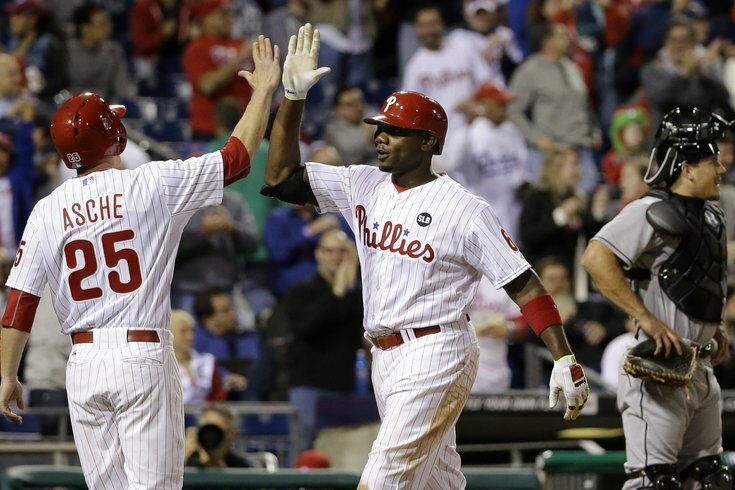 Coming off a 1-6 road trip, the Phillies showed some rare pop at the plate. They've hit just eight home runs in 14 games. Howard's homer gave the Phillies a 4-3 lead in the sixth with a drive to straightaway center. Cody Asche hit a bloop single with two outs before Howard went deep for the first time this season. Ben Revere hit a two-run triple in the seventh and scored on Chase Utley's sacrifice fly. Galvis lined one out to right in the second inning for a 2-0 lead. Stanton hit a long homer into Miami's bullpen in the fourth. Adeiny Hechavarria's RBI single tied it at 2 in the fifth. After Haren bunted into a double play, J.T Realmuto scored the go-ahead run when Dee Gordon reached on Howard's fielding error at first base. Marlins: LF Christian Yelich was scratched from the lineup 30 minutes before first pitch because of tightness in his lower back. Phillies: RHP Chad Billingsley missed his rehab start Monday because of a stomach illness. He's expected to make that start this week. OF Domonic Brown was 1 for 4 in a rehab start at Triple-A Lehigh Valley. Brown had been sidelined by a sore left Achilles. He's batting .118. Marlins RHP Jared Cosart (0-1, 4.76) faces Phillies lefty Cole Hamels (0-2, 5.00) on Wednesday night. Cosart was one of the prospects Philadelphia traded to Houston for Hunter Pence in 2011.